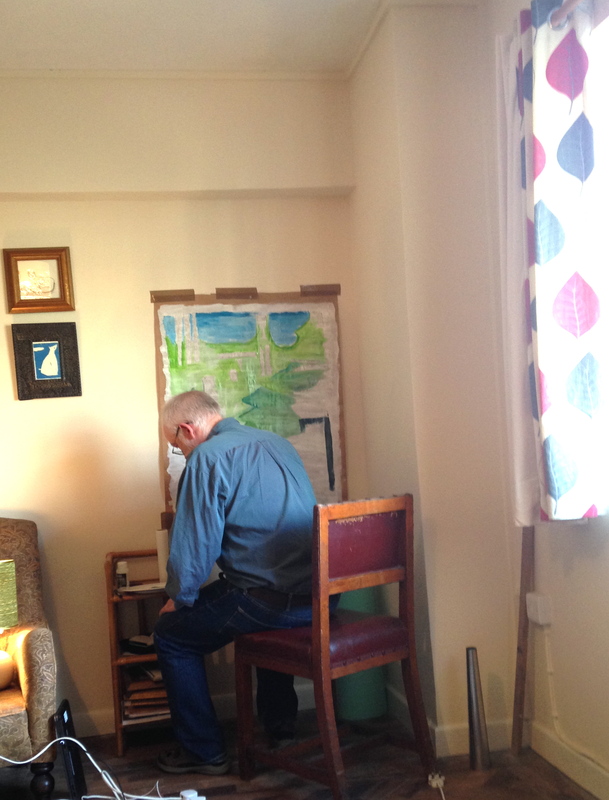 Last year someone gave me a very large picture frame that has sat empty for several months. A few weeks ago I tacked up a big piece of brown paper and started outlining a design but I kept waiting for more inspiration to come to me before I could carry on with the project. Yesterday the inspiration came in the form of AP — who paid me a visit at the studio and then sat down with some paints and worked happily for a few hours while I knotted beads. 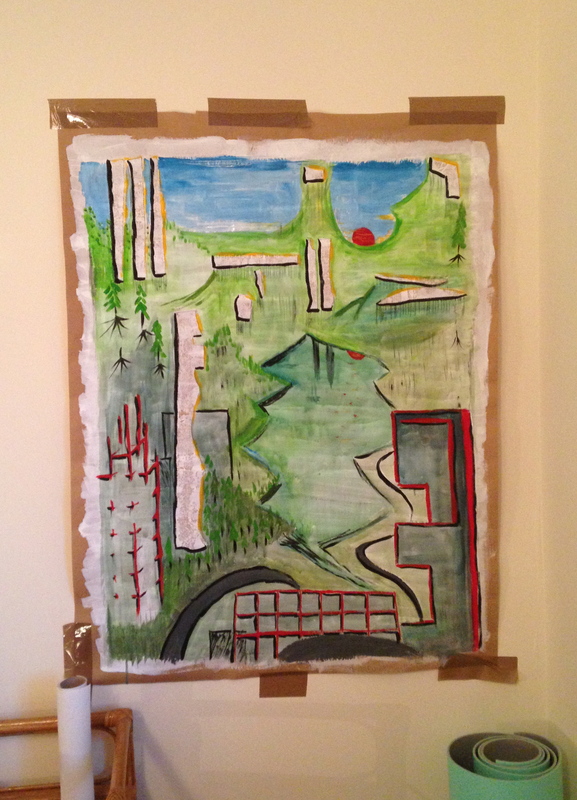 The concept, in case there is any confusion about the painting, is about our trip to the Lake District and the encroaching industrialisation of the countryside. May you find inspiration and time to create — no matter how good or bad or silly or serious. i love all of this. Your idea from your trip, design outline, AP’s jumping in, the visual of you knotting beads, AP painting (and maybe, or not, Pickles curled up near by), the quote. Warms my heart, it does. And I love what Andy did! And I love the both of you. Ahh Carol — we love you, too. I have to come clean — the concept was Andy’s. I started the work with just a few weird outlines and he completed it. But thank you for such a nice comment. Thank you, Carol. 🙂 We love you too. 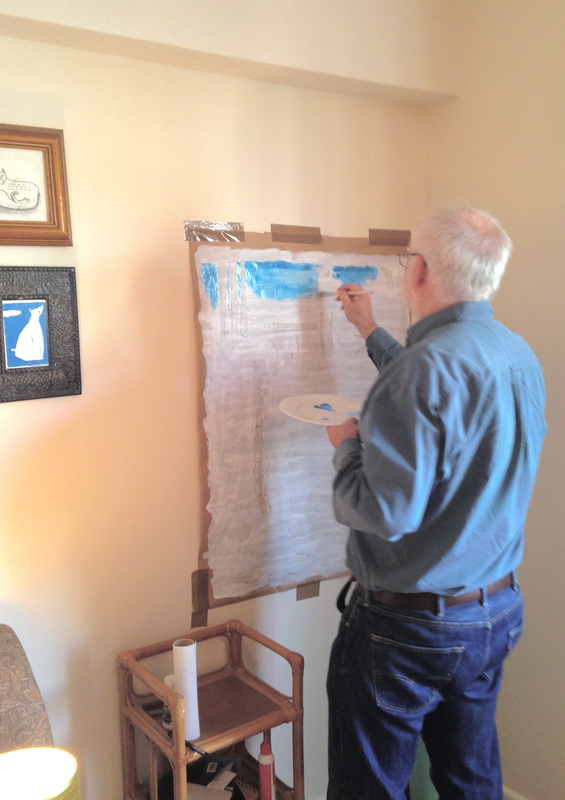 As Kim said she’d made these rune-like symbols on the page and that inspired me to do the painting. Color me impressed! Yay Andy. And Kim. And Pickles. It makes me want to be there. Well — if you WERE here there’s not a doubt in my mind that you would paint or draw something beautiful because I KNOW you’re a good artist. Teresa. Yes you. I love that Kurt Vonnegut quote. Now I know why I write my little blog stories (Although I’ve never thought of it as art). Oh, and I love the AP painting. I’ve always wondered what people are thinking when they pave over farm lands and nature. It’s land that they’ll never get back. Your blog is so funny, Alan. You’ve been a gift from the internet Gods. 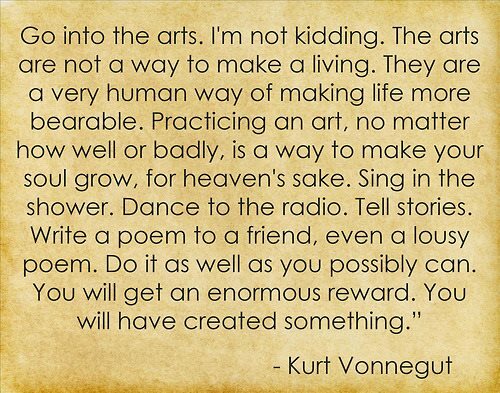 Keep writing and creating — Kurt Vonnegut says so. I hope you find your mojo today, dinahmow. Your work is beautiful.